So today I finished off my fused plastic bag projects and made some sandwich wraps and snack bags! Make a square of fused plastic about 12" x 12". (Mine ended up being a bit smaller and it still fits a sandwich so don't worry if your melting plastic has other ideas!). Then cut a piece of fabric about 14" x 14". Put your plastic on the wrong side of your fabric and pin in place around the edges. Fold it over twice so you hide the rough edge. Then pin a 2" piece of fuzzy velcro on the plastic side at the top corner (12 o'clock) and a 2" piece of rough velcro on the plastic side at the 3 o'clock. And pin a 1" piece of rough velcro at the bottom corner (6 o'clock) and a 1" piece of fuzzy velcro at the left corner (9 o'clock). Then sew them on to secure them! - Don't try to sew self adhesive velcro with a sewing machine! It does not like it and may break multiple needles in protest! - Blogging is way less fun when you have to put the photos in via html. ugh. Can't get my pics and text to line up properly. :( Hope Blogger gets fixed soon!! 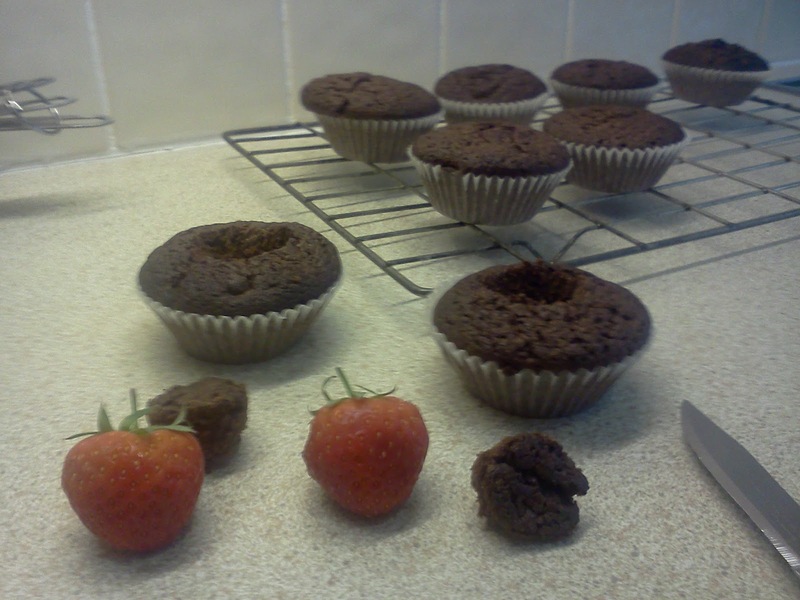 So first turn on your oven to 200 degrees and pop some muffin cases into your muffin tin. (The recipe makes about 12). First we'll make the cream cheese filling. Microwave the cream cheese for about 30 seconds. Then add the granulated sugar and vanilla essence. Stir until smooth and set to one side. In another bowl mix the dry ingredients together - plain flour, granulated sugar, light brown sugar, baking powder, bicarb of soda, ground cinnamon, ground ginger and salt. In a third bowl whisk the eggs, water and vegetable oil together until combined. Now the fun part! Spoon some of the batter into your muffin cases (about 2 spoonfuls). Then add a spoon of cream cheese filling on top. And finally put another spoon or two of batter on top of that so the cases are quite full and all your cream cheese filling is hidden! Then pop them in the oven for about 20 minutes. So today I decided to try and make some fused plastic. Pinterest seems to think it's easy and useful and who am I to argue?? First collect up some plastic bags. This process takes a lot of trial and error so you'll definitely need to practice! Prepare your bags by cutting off the handles and the bottom. Depending on the size of the piece of plastic you need you might cut the bag open. Lay a few pieces of plastic on top of each other. Put some baking parchment on your ironing board, place the bags on top and layer with another sheet of parchment. Apparently ordinary paper works too but I didn't test it. Turn on your iron and iron over the parchment. Make sure not to iron directly onto the plastic or you'll have a sticky mess on your iron that will be no fun to clean off! Peel up the parchment and see how its doing! There seems to be a lot of different opinions on the number of layers and heat of the iron so I can only suggest doing what I did - try and see what works for you! My first attempt had a lot of holes in it which could have been because my iron was too hot or I didn't have enough layers. I found that a about 5 or 6 layers worked best but it depended on the strength of the bags. You can cut letters off other bags to write messages on your plastic or cut up bits of plastic to make your own. Place another bag on top of the letters to prevent them from peeling off later. But watch out for static ruining your fun!! - Making fused plastic is not as easy as those videos look! - Using the same type of bag works much better than just putting all the random bags you have together. Well worth buying some bin bags or something. - This would have been way more useful/green/cheap a few years ago when we didn't have to pay for plastic bags in the supermarket! I've recently found a great blog where someone is doing pretty much the same challenge as me ... times 12!! 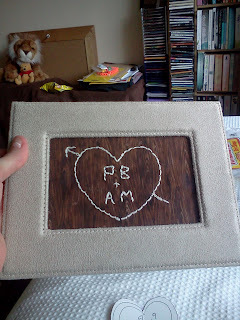 I've linked up to her blog and you can to by clicking the button below! Day Four - Bell Pepper Fried Eggs! Busy day entertaining little visitors today so my project was indeed small! For me to actually keep this project a day thing up I figure I may have to be less ambitious and do more like this though! Chop up some peppers, nice thick slices! Orange ones would look pretty too but this is all I had in the fridge. Oh and the bigger the better, the red one was a bit too tiny! Pop them in the frying pan with a little oil (or way too much by the looks of my pics now!). Crack an egg into each one. Don't worry if they overflow! You can tidy them up later! - Everybody cheats, these looked a mess at first til I cut off the egg white that overflowed! - Don't forget to take pictures of the final product on a plate, doh! Next I sewed the pieces to the front and back of each puppet. Which took f-o-r-e-v-e-r!! Those little paws? Ugh!! Then I pinned the front and back together and sewed them up! Moment of truth - turn them the right way out and hope those ears are on right!! They're from a set of Old MacDonald puppets that I found patterns and a tutorial for here but I haven't made them all. Maybe I'll add to my collection another day! Love these two the most!! - Sewing machines are the devil! - Bad sewing can be fixed by trimming off all the excess felt from where your straight line has gone diagonal! - Sewing takes forever!! Maybe doing one project a day was a bit ambitious! - I kinda love puppets! Small project tomorrow I think! Day Two of the 30 Day Creativity Challenge! I had great plans for today's project, had everything cut and ready to be sewn but the sewing machine is broken!! So I'm going to cheat a little. I know, pretty bad for only day 2 but at least I'm keeping to the blogging each day part! 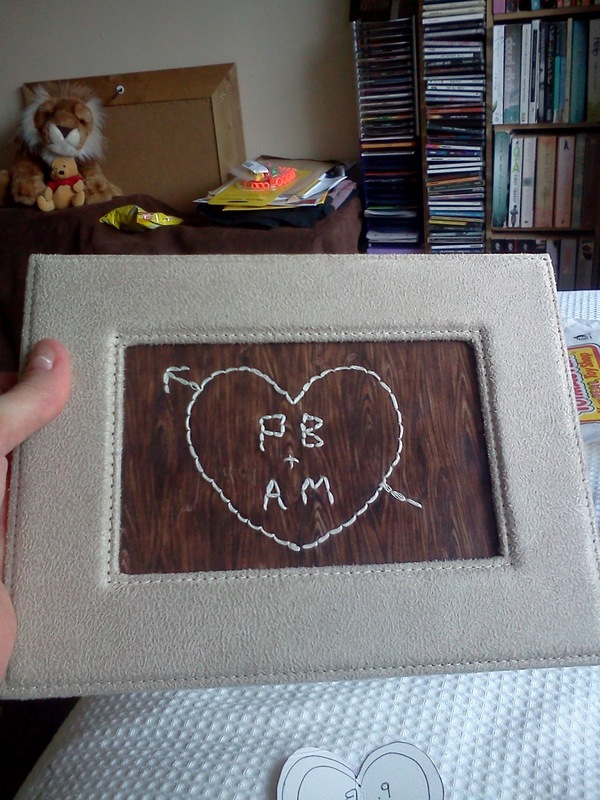 So I actually made this a few week's ago for a friend's engagement. I found a much nicer frame for it but forgot to take another photo before I gave it to them!! 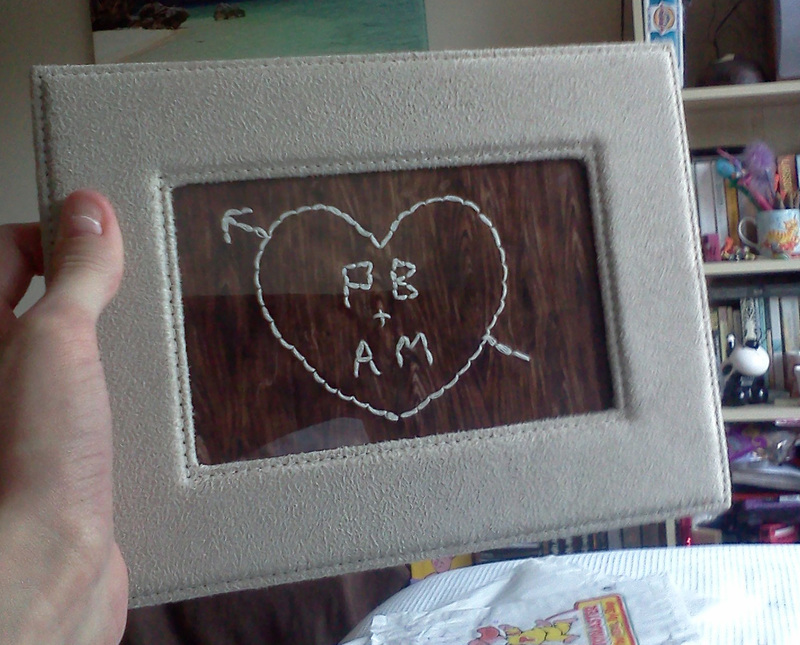 If I was making another I'd do the heart a bit smaller but it did look better in its new frame! 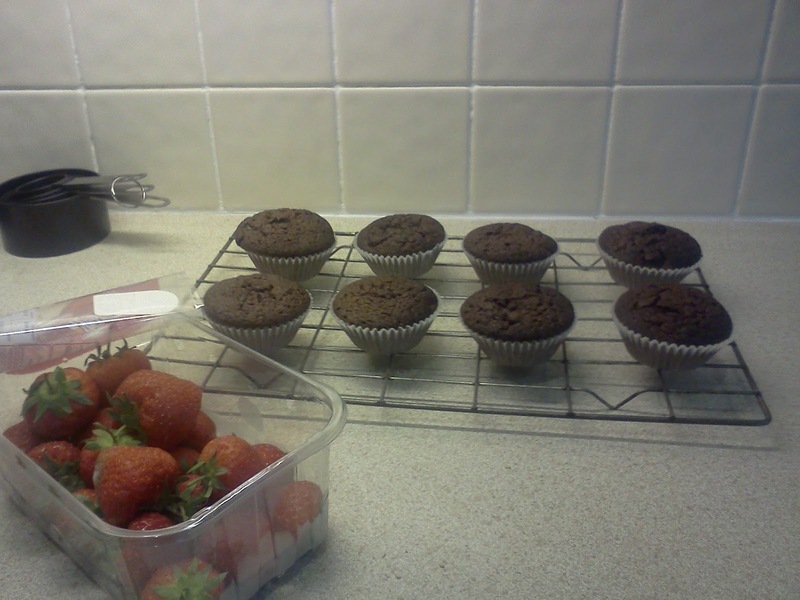 Day 1 - Strawberry Brownie Cupcakes! Day One of the 30 Day Creativity Challenge! Unfortunately the 30 day challenge idea only came to me mid bake and my good camera's battery was dead so the first few pics were taken on my phone. Tomorrow will be better, promise!! 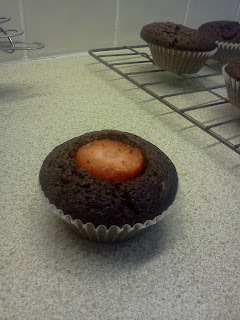 Next I cut out a little piece from each cupcake, just big enough to pop a strawberry in. 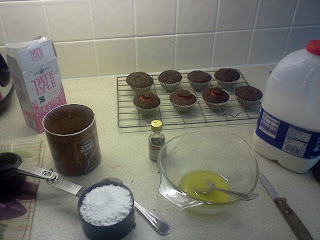 And, once the icing has set, serve them on plate cut in half. Beautiful! And pretty tasty too!